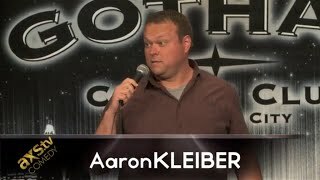 Dad, actor, comedian, Aaron Kleiber, energized, crowd-pleasing live performances with tales of life, marriage and fatherhood, had him break-out as one of the most in-demand feature acts - touring alongside the likes of Bob Saget, Jim Breuer, John Witherspoon and Harland Williams. Now, a bona fide headliner himself, touring all of North America. Seen on 'Gotham Comedy Live' (including 'Best of Season 2'), 'Standup and Deliver,' Nickelodeon, multiple appearances on Doug Loves Movies, in feature films and dozens of commercials. You can also hear him chat weekly on his hit podcast "GrownDadBusiness with comedians about parenting, childhood and the comedy life.